Columbus Ohio Photographer DGN Photography, newborn baby children maternity family senior pictures pregnancy wedding. 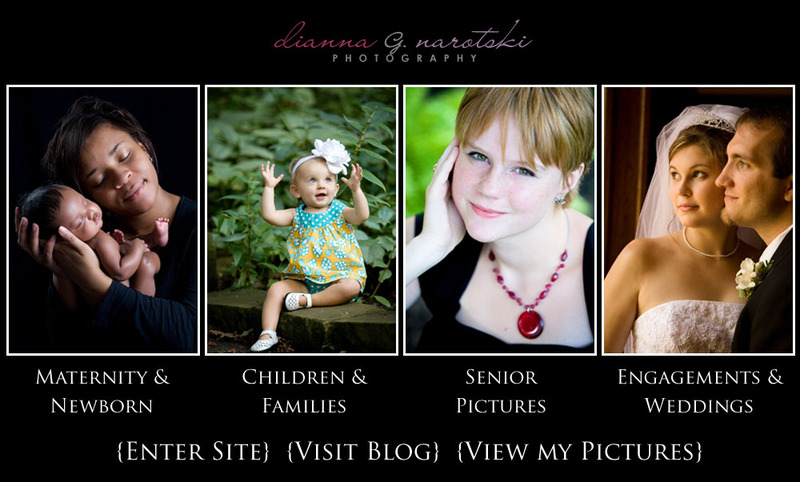 Dianna Narotski Photography is a Columbus Ohio area photographer specializing in maternity, pregnancy photos, newborn portraits, baby photographer, children, family, seniors, wedding photographer, events, bar/bat mitzvah, headshots, portraits in studio or on-location, at your home, at the park, or in an urban setting. Located in Columbus Ohio, she serves Westerville, Gahanna, Worthington, Dublin, Pickerington, Grove City, Groveport, Canal Winchester, Hilliard, Delaware, Lewis Center, Grandview, Clintonville, Blacklick and Upper Arlington. Studio hours are by appointment only, so please call to schedule your wedding consultation or photography session. Dianna does studio photography as well as on-location photography, with either natural light or artificial light (strobes). She uses her artistic eye to create images that will be cherished for the years to come. She enjoys photographing babies and young children, on up through high school seniors and families. Photographing pregnant women for their maternity photos and then returning to photograph the precious newborns is something she also really enjoys. She also is a wedding photographer and photographs other events, such as a quincanera party, birthday party, or bar/bat mitzvah and capturing those special moments. She has also done photographic work for businesses, primarily headshots. Please have a look around her web site, and you can contact her at 614-323-3147 or dianna(at)dgnphoto(dot)net if you have any questions, special requests, or if you would like to book a portrait session, either in the studio, on-location at a park or even your home. DGN Photography is a proud WedPlan wedding photographer. Wedding Planning with Dress Up Your Wedding! ClickPhotographer.com - The Comprehensive Photographer Directory. to help plan the perfect day! SuperWeddings.com>- Wedding planning Ideas, Ideas, Ideas!!! ideas for a more personalized & meaningful wedding, plus expert planning tips, money saving secrets, wedding career info + more! personal list of some great photographers for you! All content and images on this web site are copyright DGN Photography in Columbus, OH. Please don't right click, direct link, print screen, or otherwise steal any images or copy any text or you will receive bad karma.